With this time of year comes all of those New Years Resolutions and trying to make this year a great year. And luckily for those of us trying to be a little healthier, Ocean Spray has launched a Low Sugar version of it's Cranberry Drink. 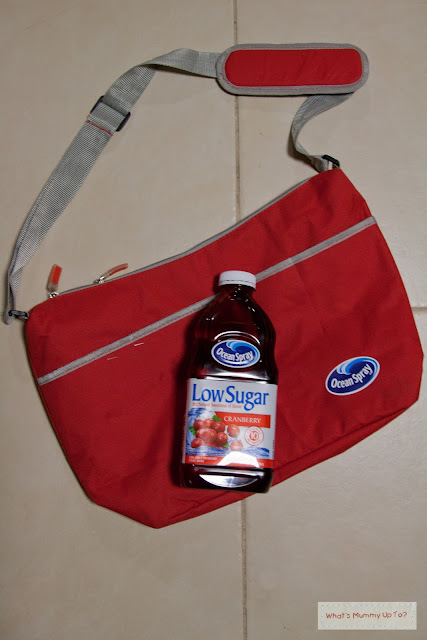 I've loved Ocean Spray Cranberry forever, so when I was asked if I'd like to try the Ocean Spray Low Sugar Cranberry Fruit Drink, I was stoked. So, not really as a new years resolution, but rather as a late-last-year resolution, Daddy and I have been trying to be healthier. We're not focussing specifically on weight loss or on anything in particular, but since the reality check of Daddy having his cough-mumble-40th-mumble-cough birthday last year, we realised we're not getting any younger and we've been making a concerted effort to be healthier, move more and enjoy the extra energy and good health that comes with all of that. We've been walking most days (we take it in turns, so that we can go for a walk on our own!!!! Bliss! ), Daddy's joined the gym at his work, and has been enjoying some Kayaking, and I have recently started running (I'm doing the Couch to 5k 8-week program to help me get into it, and I'm loving it so far ... just finished week 3). We're trying to eat fast-food less, and trying to be a little more careful about what we eat. Another thing we try to do is to avoid sugary drinks, and we all know juice is often just as sugary as soft-drink, so it's not always a better option, but water really does get boring, huh! Well, the Ocean Spray Low Sugar Cranberry Fruit Drink is a great low sugar option to consider. It's only 10 calories per serve and is sweetened with Stevia. If you like the regular Ocean Spray Cranberry Drink, then this could be a great swap option for steering clear of some sugar. Anyway, I was gifted a few bottles of this yummy drink to try, along with this awesome red cooler bag ... it's already been put to good use when it accompanied the girls and I to the school swimming carnival last week. Love a cooler bag that looks like a funky red shoulder bag! We drank one bottle pretty much straight away, and it was a lovely change. I then decided I'd be a little creative with my next bottle. I decided to whip up a little dessert, using the Ocean Spray Low Sugar Cranberry Fruit Drink, and with it's bright red colour, I thought this would be the cutest healthier-option Valentines Day dessert. 1. 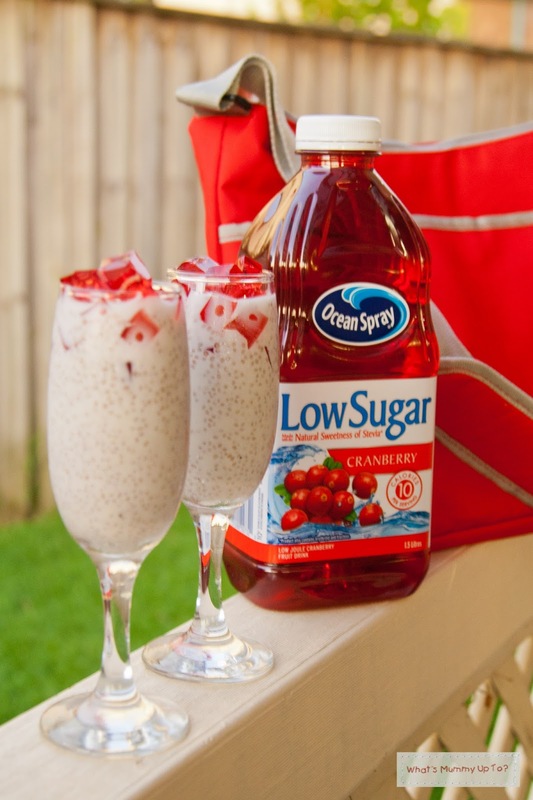 Pour you Ocean Spray Low Sugar Cranberry Fruit Drink into a microwave bowl or jug, and heat for 2 minutes in the microwave. 2. Add the powdered gelatine - follow the instructions on the pack as to amounts for setting 2 cups of liquid. (I added 1 tablespoon). Mix until the gelatine is dissolved. 3. Line a lamington or sponge-cake tin with cling-wrap, and pour the juice/gelatine mixture in. I like to strain it through a sieve to make sure than any sneaky lumps of gelatine that may have remained don't end up in the jelly. Put the jelly in the fridge until it's set. 4. Grab a couple of champagne flutes, and put a tablespoon of Chia seeds in each glass. 5. Pour 1/2 cup of the coconut milk into each glass, and mix well until all the Chia seeds are wet, and are mixed through the coconut milk. 6. Add 1 teaspoon of maple syrup to each glass and mix well. 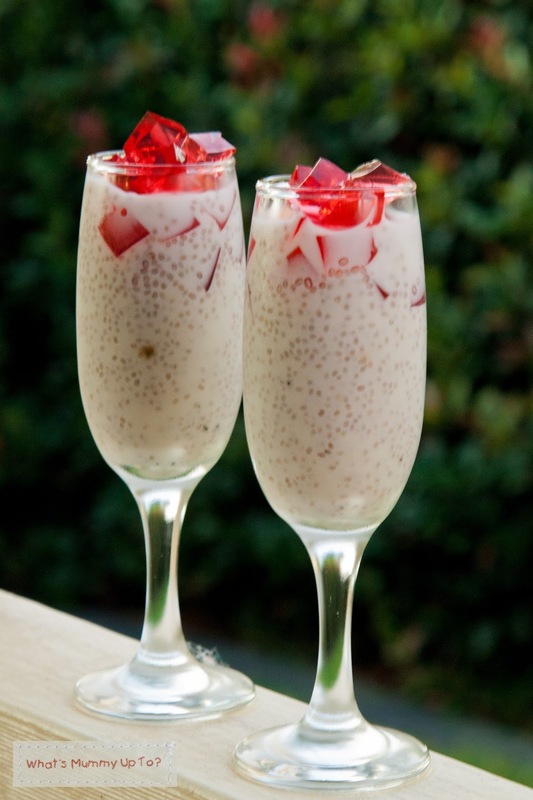 At this point you just need to refrigerate the Chia Pudding for a couple of hours. As it chills the chia seeds absorb the coconut milk and become chewy, and this makes the pudding thicken too. 7. 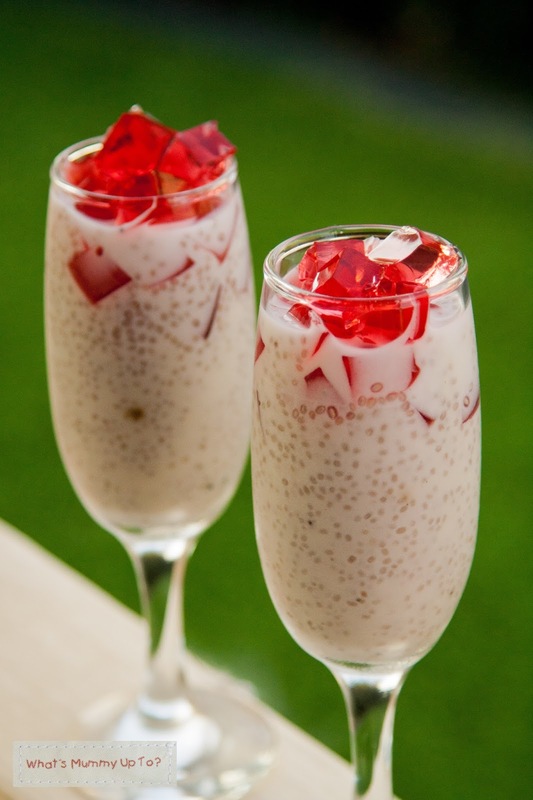 Remove your jelly from the tin by lifting out the cling-wrap, then use a knife to slice into 1cm cubes, then spoon the jelly cubes onto the Chia pudding. You can then share one with someone you love this Valentines Day, or just eat one and save the other in the fridge 'til tomorrow ... either works fine!! Anyway, feel free to share your healthy habits for 2016, so I can use them too!! And I hope you have a lovely Valentines Day with those you love!